Throughout June, the College of Podiatry is raising awareness of the importance of looking after your feet, whatever your age, with its Feet for Life 2017 campaign. As the campaign’s name suggests, foot health should be a priority during every stage of our lives, not least because we depend on our feet to keep us mobile and help us to make the most of each day. 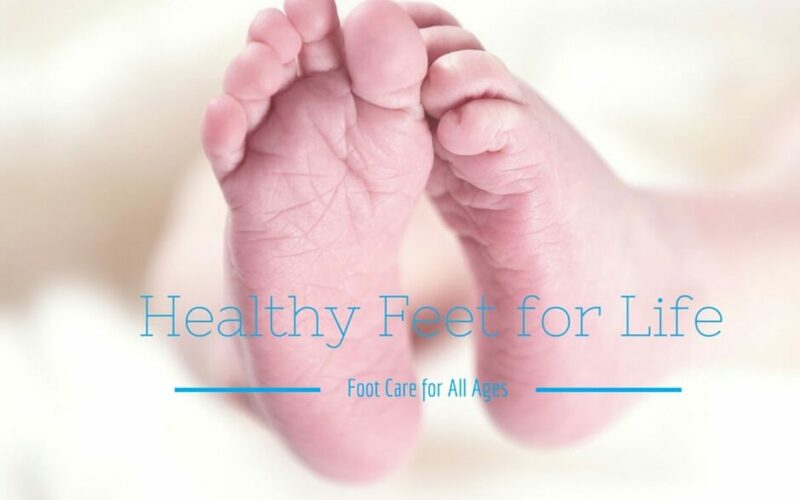 Our feet change considerably over time, so the kind of care they require also changes. That’s why we’ve created this guide to foot care for all ages. It’s full of tips for you and your loved ones, young and old, to help you safeguard your foot health for the years to come. Did you know there are no fully developed bones in babies’ feet? The bones are mainly made of cartilage, which gradually hardens. What’s more, each foot has a fat pad in the area where the arch later appears. As a result, babies’ feet are soft, pliable and flat; they also grow quickly. It’s vital that socks, booties and sleepsuits aren’t restrictive – babies’ feet must be able to move freely to help strengthen the muscles and avoid developing abnormalities. Infants take their first steps at around a year old and benefit from periods spent ‘toddling’ barefoot at home each day (parents should check that the floors are free of sharp objects first). Exercising with bare feet will enable them to grow stronger and more sure-footed. When toddlers are confident enough to walk outside, they need fitted footwear. Shoes with flexible, non-slip soles, adjustable fastenings, soft leather uppers and room for growth are best for foot health. Young, fast-growing feet need re-measuring at least every two months. Inspect your toddler’s feet for signs of blisters, sores and other shoe-related problems. If your toddler hasn’t started walking by 18 months old, seek professional advice. Children’s feet don’t look flat like those of babies and toddlers, but they’re still growing and developing. In fact, feet increase by about one size per year during childhood. As school shoes are worn for over six hours on most days, it’s vital that they’re properly fitted and comfortable. Footwear with heel and ankle support, rounded fronts and shock-absorbing soles helps to protect kids’ feet. Parents should watch out for unusual patterns of wear, which can point to problems such as over-supination (feet rolling outwards). At school and in their spare time, children take part in activities that place new demands on their feet: ballet, gymnastics, martial arts, etc. Foot pain, especially in the arches, is common, while verrucae and other foot infections spread like wildfire in changing rooms. It’s reassuring to know that podiatrists provide expert foot care for children and younger infants. Podiatry encompasses everything from verruca treatment to more advanced services such as gait analysis, which helps foot specialists to identify a wide range of problems with foot and ankle function for patients of all ages. During puberty, the body sweats more than before. Each pair of feet has around 250,000 sweat glands, so it’s not hard to see why foot odour is a major issue for teenagers. It’s important to wash and dry feet thoroughly every day. Because poorly made, ill-fitting socks and tights can cause foot problems including excessive sweating, teens in particular benefit from wearing comfortable, wool hosiery, which draws moisture away from the skin. Damp, dark, warm conditions can also lead to athlete’s foot, which makes feet sore and scaly. Thankfully, podiatrists have the expertise to eradicate the infection. Teenagers can develop painful ingrown toenails, especially if they’ve recently started trimming their nails by themselves. They should always be cut straight across and never given curved edges. If toenail surgery is required, it can be performed at a foot clinic. Women are sometimes tempted to sacrifice foot health for fashion (and the same can be said about teenage girls). However, if you consider what happens to your feet when you wear high heels, those shoes quickly lose their appeal. Footwear that forces feet to assume unnatural positions can cause everything from skin damage to deformities. Fashionable flat shoes can lead to foot problems, as they offer so little protection and support. Because men are often less concerned about the appearance of their feet than women, they’re more likely to overlook foot conditions. That means minor issues, such as blisters, cracked heels and fungal nail infections, can turn into serious health problems. The best approach is to inspect feet regularly and seek professional help swiftly when necessary. You’ll notice that your feet change as you age – they become drier and stiffer, as well as spreading out. In addition, their ability to cope with intense activity diminishes. The effects of the ageing process aren’t reversible, but they can be reduced with the aid of a good-quality foot cream, regular, gentle exercise and well-cushioned shoes. Older people’s feet are particularly vulnerable to ailments and injuries, which can be exacerbated by diabetes and other conditions that often cause problems during later life. Specialist foot care for diabetics includes thorough neurological, vascular and skin checks. Diabetic foot assessments are vital during every stage of life, but it’s often the elderly who suffer the most from diabetes-related nerve damage, foot ulcers and muscle weakness. It’s advisable to have a foot health check at least twice a year, whatever your age. With the help of podiatrists, you and your family can keep your feet as fit as possible for as long as possible. For expert foot care from our London podiatrists, please call Feet By Pody today on 0207 099 6657 or book your appointment online.